Wonder no more - Denny's has done it. The answer: Deep-fried mozzarella cheese sticks smothered in American cheese and grilled between two slices of sourdough bread. 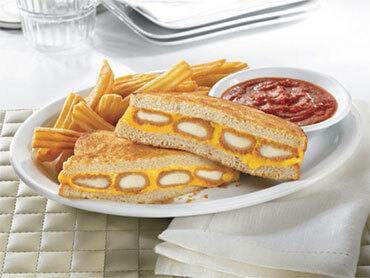 That's what you get with Denny's new Fried Cheese Melt. The price is reasonable, too. According to The Eater.com, the sandwich, served with french fries and a side of marinara sauce, will cost just $4. However, CBS News correspondent Jeff Glor reported the cost to your diet is 895 calories and 34 grams of fat. This is the latest extreme meal to be released -- and it might be a little tame. Other chains have come up with a variety of diet-busting concoctions. KFC has the Double Down, a "sandwich" made of two deep fried chicken breasts, two pieces of cheese and bacon that had about 500 calories. Friendly's 1,160 calorie Ultimate Grilled Cheese Burger Melt replaced the traditional bun with two grilled cheese sandwiches. And IHOP has their Pancake Stackers, a confection of crustless cheesecake filling surrounded by two buttermilk pancakes and topped with a strawberry, blueberry or cinnamon apple compote and whipped topping. A combo meal, which includes Pancake Stackers with strawberries, two eggs, bacon and hash browns, runs 1,250 calories. For more on Denny's new sandwich, click on the video below.